The classic wash, a.k.a your average mid-blue jean color, is the safest and most acceptable hue. To get this look, raw denim is rinsed and then bleach added to soften the inkiness. 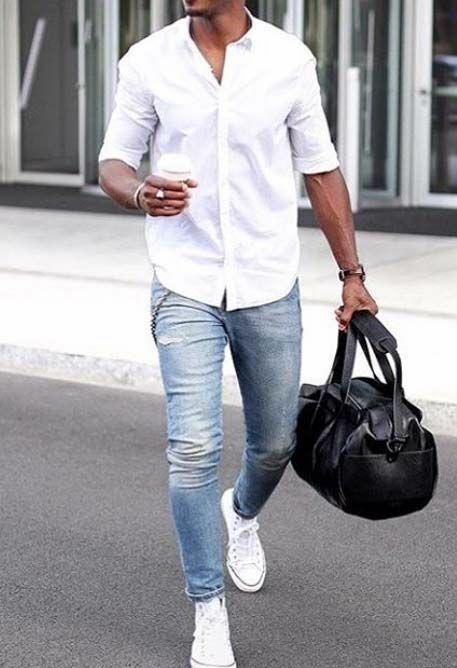 A classic wash is best for more casual jeans (relaxed fit and classic) worn for more off-duty occasions. Designed for those who want good things – now, vintage wash takes the time out of breaking in a new pair of jeans (something that can take years and by this stage the jeans’ crotch has ripped open or waistband given way). Dubbed ‘distressed denims’, raw denim is put through vigorous rinsing (depending on how light the final colour will be) as well as sanding at the seams, knees, and thighs. Dark rinse jeans are close to the original raw start of the untreated denim but have been washed once or twice to retain the color but loose the stiffness that comes with raw denim. Often with variation shading around the seams, knees and pockets, the dark blue works like black trousers would do. A perfect color for skinny jeans with light denims jacket or with a blazer in classic fit for more smart casual times. This is denim is untainted, unwashed, and wild. In line with its untreated mantra, the cloth is dense and rigid. Selvage denim is when the two ends of a roll of cotton are used to make jeans, from which only a handful of pairs can be made, and is signified by a pair of white parallel lines on the cuff. It’s a version of raw and is a unique approach to denims. Raw jeans are like antiques in that they can last for years, taking months to signs of wear and tear. Denims are about keeping things simple, minimizing embellishments, logos and random patches or stitching. Take the time to know what color or type suits you best. Good luck filling your wardrobe!